Just want to relax and let your mind wander? To enjoy freshly caught fish at the restaurant �Friday's�, which is known across the island�s borders? To rediscover your own creativity? Welcome to Northeney, here you can do all this! 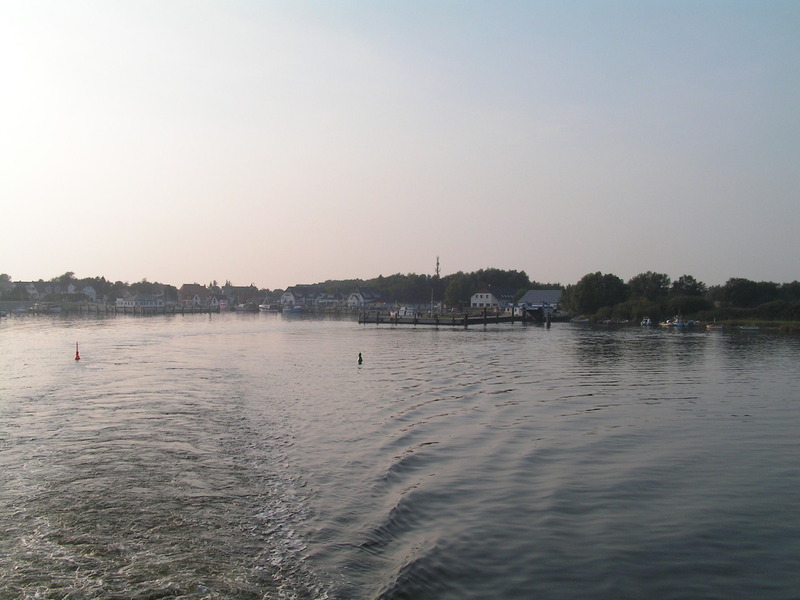 For a long time Northeney had stood in the shadow of larger neighbor�s islands. But especially in the last few years this has proved to be a great advantage. While the others have turned into tourist ghettos, Northeney can offer (almost) untouched nature. 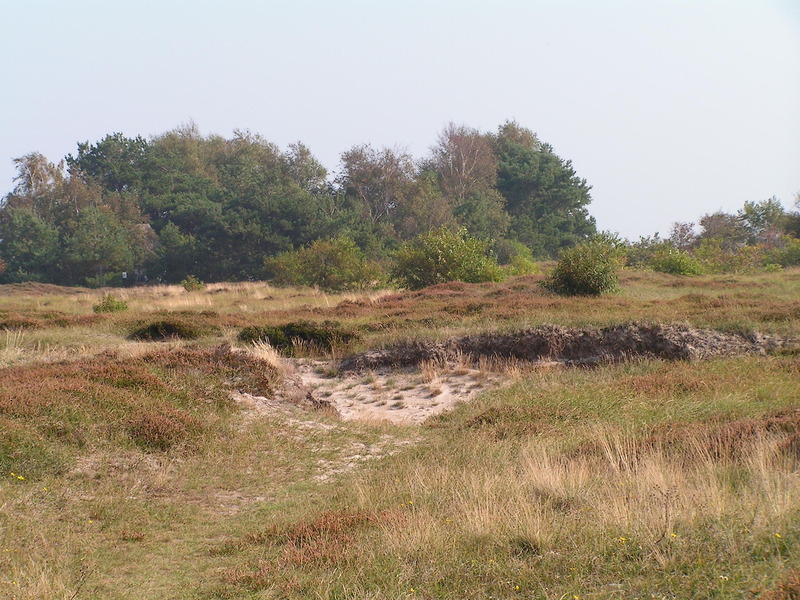 Enjoy endless walks in the dunes, experience fantastic sunsets (weather permitting), have a barbecue at the beach. However, please don�t forget to bring a rain jacket and warm socks - here on the island in the Northern hemisphere the weather can change quickly! Please note also that large parts of the dunes are subject to nature conservancy protection. Please keep on designated trails. 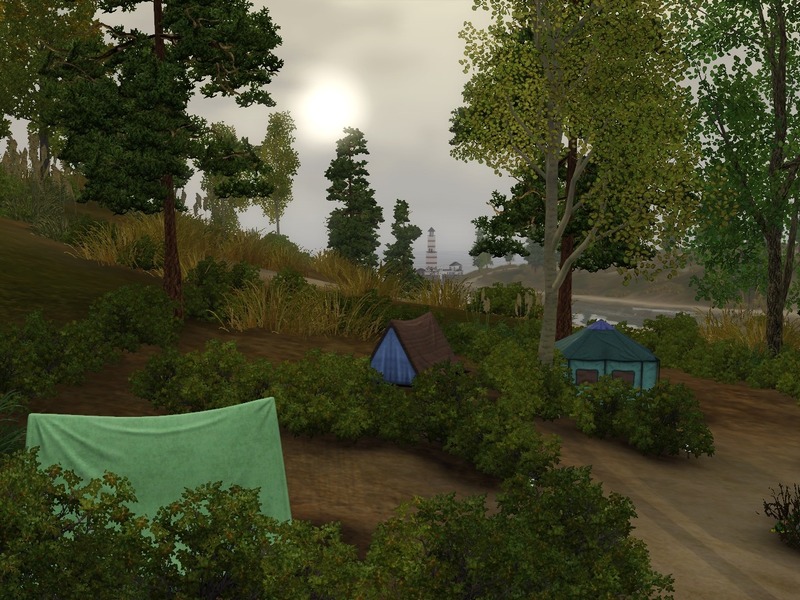 Camping is only allowed at official camp sites. Please take your litter with you and keep your dog on a leash at all times. 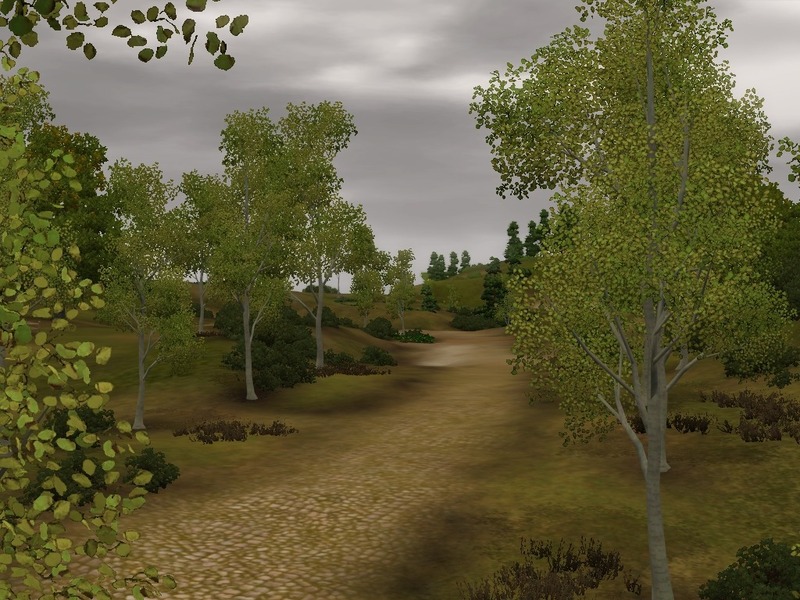 After two years of working on this world it�s finally ready for release. It started as a small vacation world but somehow grew into a full world. Northeney is a bit of a mixture of locations. In our world it would probably be located in the South-Western part of the Baltic Sea. 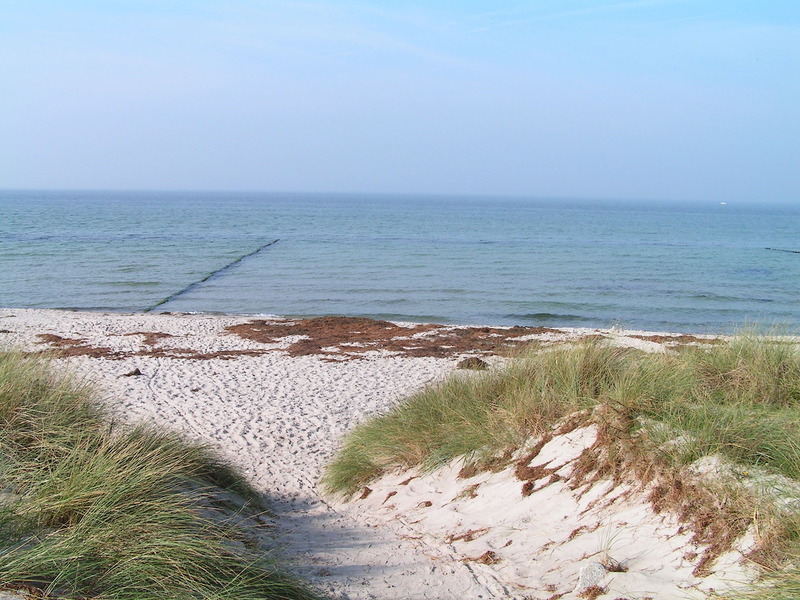 Inspirational pictures below are from Hiddensee and the Zingst peninsula. 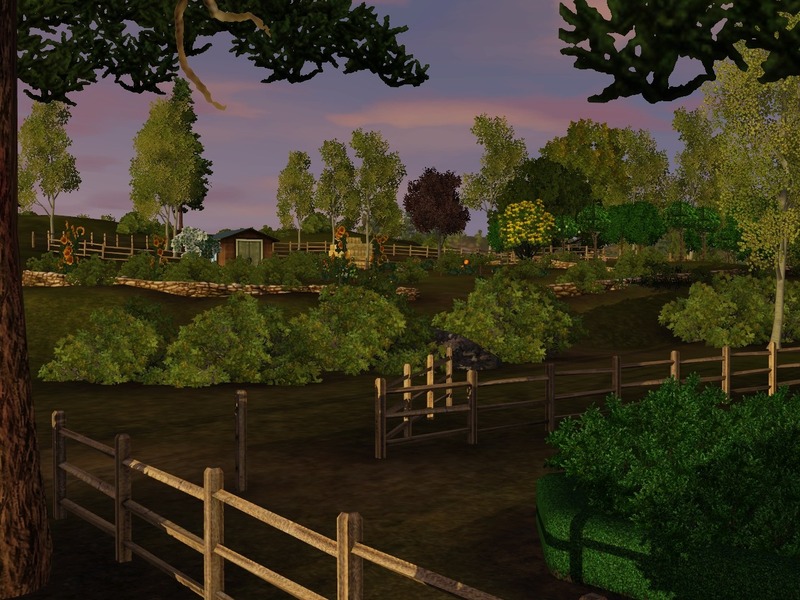 But then, I took a lot of liberties with style and landscaping so it�s not a �real� place anymore. It�s not intended to be a recognisable place. It�s a roadless world. It may take some time until the sims have reached their destination. Also, this comes with some restrictions (see below). The world contains most career rabbitholes (with the help of rabbithole rugs, see below). 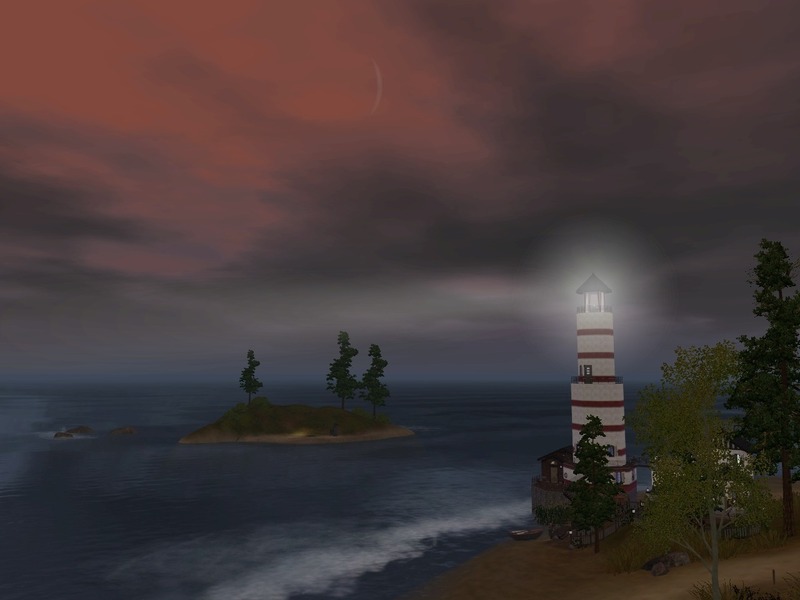 The lighthouse is working - but the effect is only visible if you are on the lot or very close by. A save is included in the download (see more details below). It will add population and fix some things that cannot be done in CAW. Even if you don't intend to play with the included population I recommend starting any new game in Northeney by the provided save. Spawn Points: all spawners from Basegame, Late Night, Pets, Seasons, Supernatural, IP. Not all of them are in the world, some are on lots only. 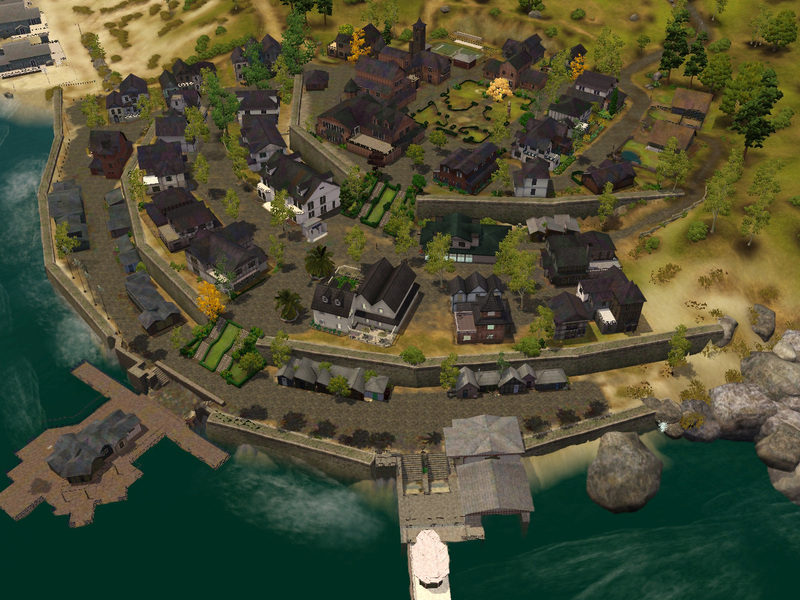 There are only a couple of spawners from WA, none from ITF, also no junk spawners (Ambitions). Junk piles can be found on some lots though. 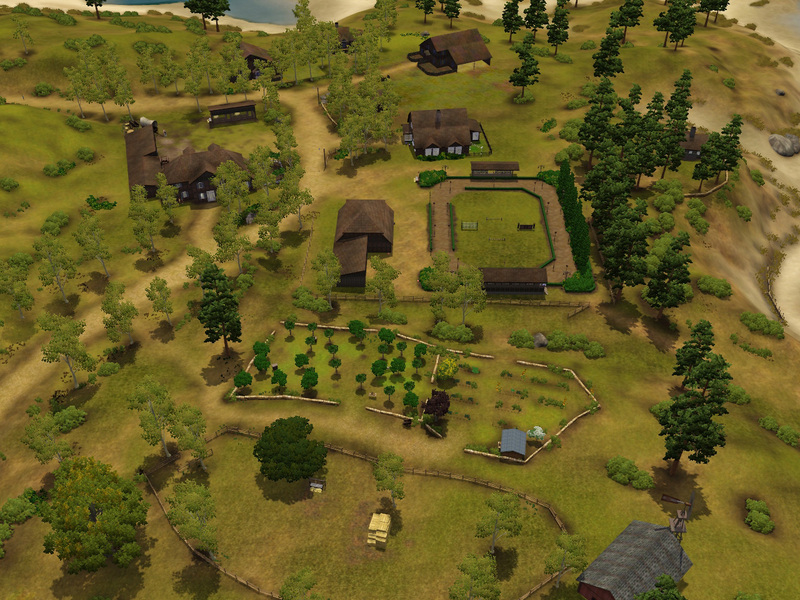 All non-opportunity based harvestable plants from all EP can be found on the island (in the world or on a lot). 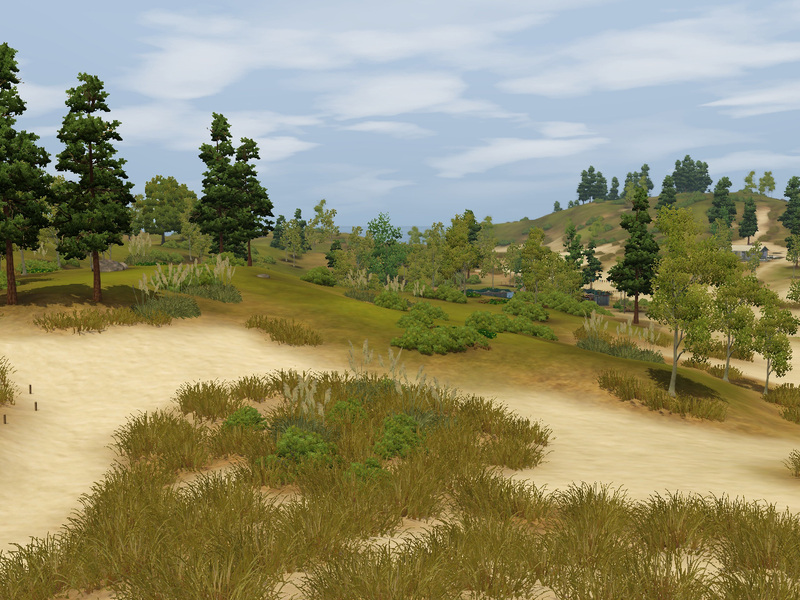 Most parts of the islands are routable, only steep slopes or areas with dense vegetation are not accessible for sims. Non-camera routing was applied at the map edges. The world contains most base game career rabbitholes (with the help of rabbithole rugs, see below). 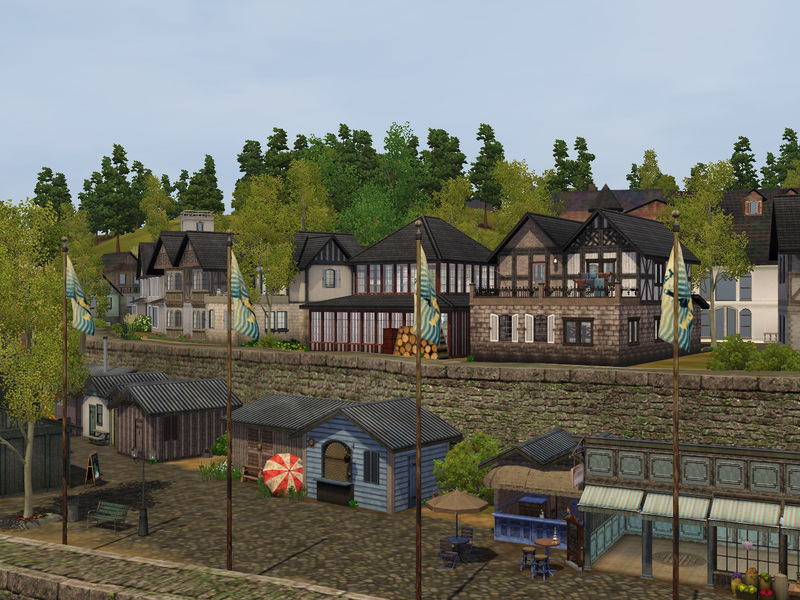 Also included is the fortune teller�s waggon and lifeguard chair. There is no military nor police station rabbithole. 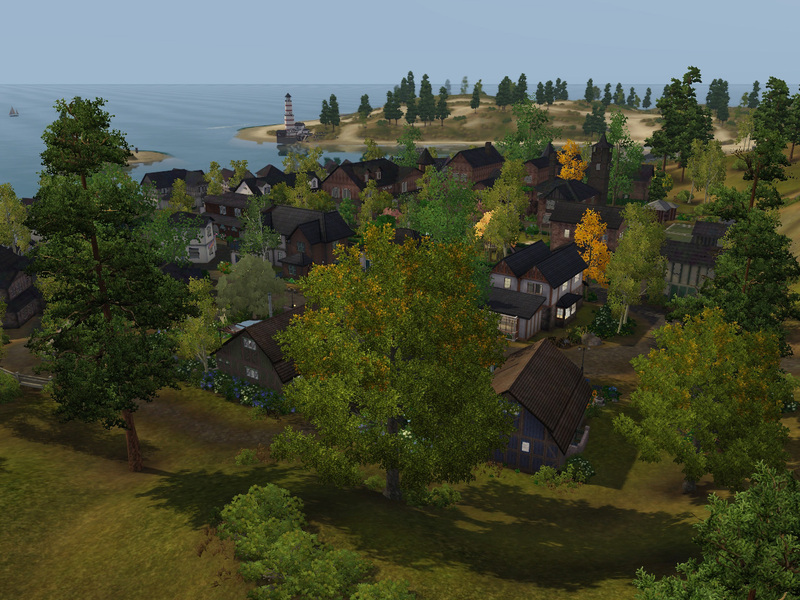 While your sims will be able to call the police in case of a burglary, no one will come. 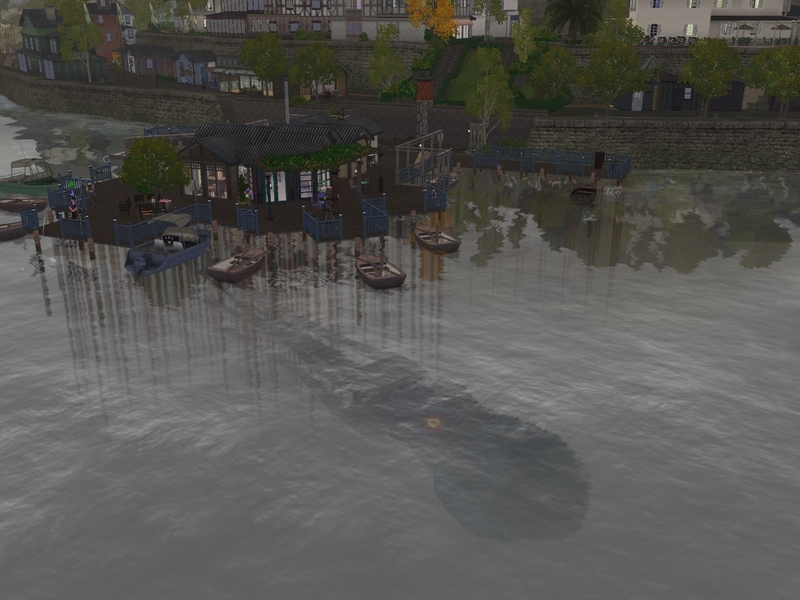 I guess it just takes too long for the police officers to get to the island from mainland�. 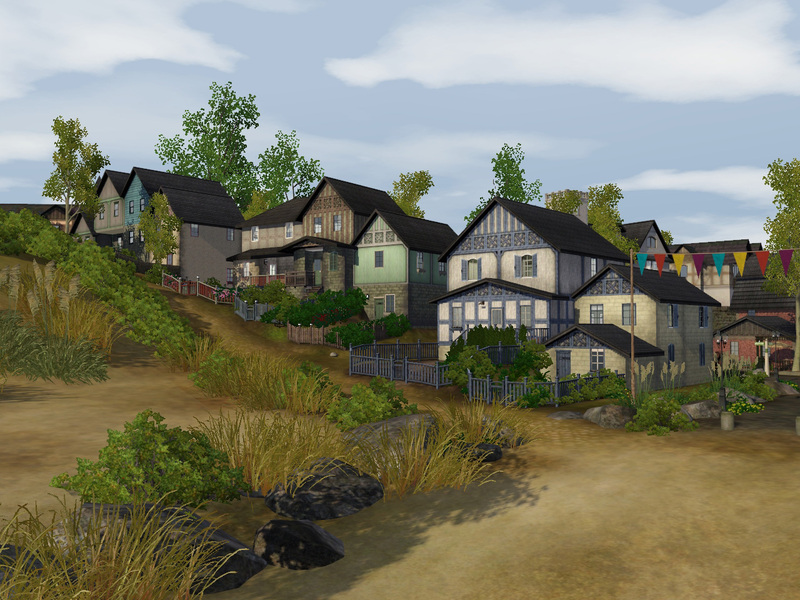 The save is populated with 23 households and 60 living sims in total (this includes two dogs, a horse and two cats). Most of them have careers assigned and some skills, as well as relationships between households. Aydogdu 2 1 The Aydogdus were looking for a quieter lifestyle for their family. Now that they've made Northeney their home they hope that their kids will like it here as much as they do. Household created by willky12. Bastian 1 Lucia is the typical effected artist who loves the latest exhibition at the local Gallery. The cinematic lighting juxtaposes with the blas� textures and colours in each piece, simply fabulous! Household created by willky12. Buchholz 1 Anton has always been very particular about things. He loves his flowers and has the best roses in town. Household created by willky12. Fried 2 1 1 You won't meet the Frieds in town, they usually stay at home playing video games. Only little Thomas is deviant, he was seen playing outside on the playground lately - how could this happen?! Gebhardt 2 1 Newly weds Gabriel and Bianka have a nice little nest in Northeney. A pair of free spirits with eyes only for each other, and occasionally their cat, Princess. Household created by willky12. Jansen 2 2 The Jansens belong to this island like the weather. They are well liked because of or maybe despite their reticent charm which is typical for this region. 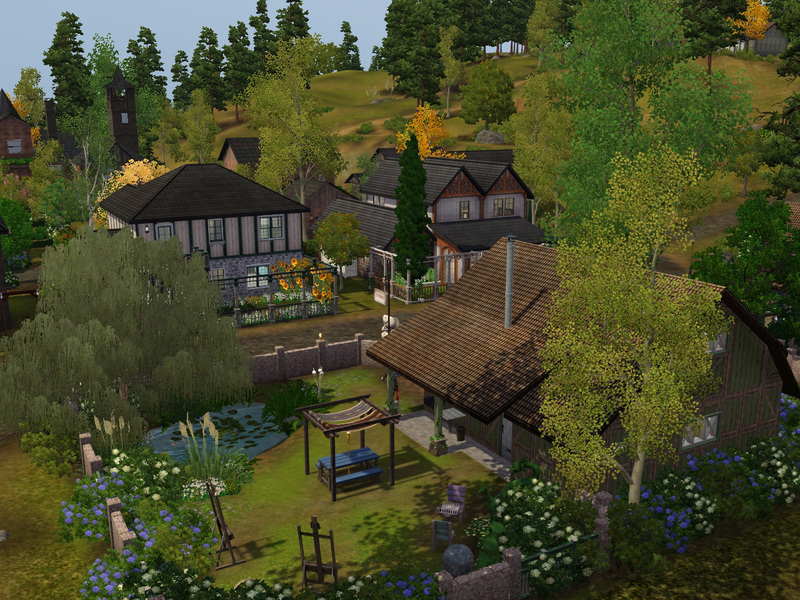 Household created by titosims. June 1 1 It wasn't always easy for Jaydee, but her looks often helped her. Don't trust this cute face though. 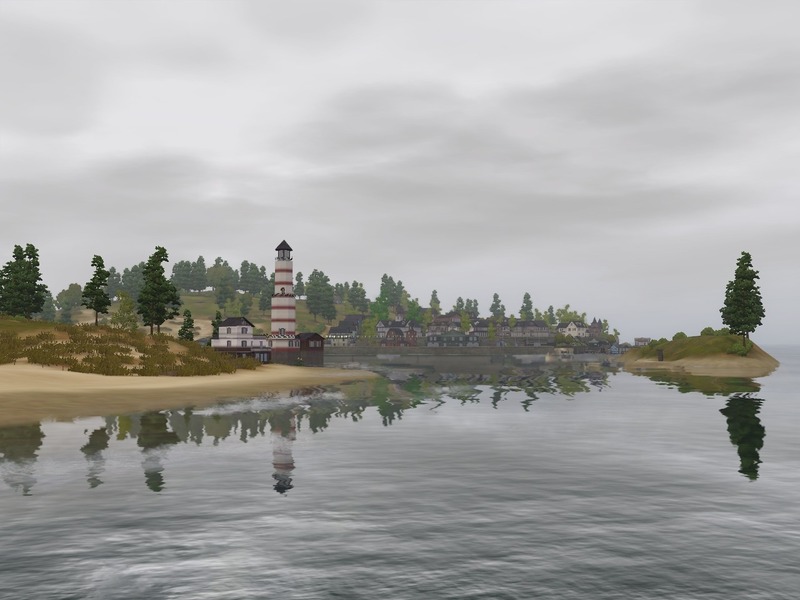 Household created by Crowkeeper. Junker 1 Hard work and talking to the right people - this is how you progress in life and make your ideas come true. And ideas does Steffen have a lot! Kindler 2 1 1 1 Dr. Kindler is a successful doctor. Lately he seems to be more tired than usual though. Maybe it is because his wife is working again after the birth of their third child. Or maybe it's because his oldest daughter Nele refuses to be a famous pianist. Household created by willky12. Lehmann 2 The idylllic scenery invites artists of all sorts, and Jana and Nico are no different. Two house mates with an air of mystery about them. Why does Nico always wear sunglasses? Jana, what�s with all the black all the time? Musicians, so temperamental! Household created by willky12. Mahlmann 2 It's about time Frederik takes care of his own life but as long as Rebekka doesn't have plans to start her own family her younger brother may stay. Household created by willky12. Meier 1 After having finished her university with best grades Alana returned to Northeney to pursue a career as professional athlete. It would help her career though if she was more often actually at work than on a surfbord� Household created by RoocheySims. Angerer 3 2 1 The twins were already quite a handful, then came little Johan. Now Grandpa Johan died - how will they cope? Oltmann 2 1 1 The love was big when they met at university. Now the kids are big and Hana would like to get back to working again. Kai has climbed the job ladder and wouldn't want to hear any of that. Schlopp 1 Wulf likes it a bit more rustic, no frills. His hair turned white over night - if the first (and only) meeting with Agnes got something to do with it? Household created by willky12. Scholl 2 1 The Scholl�s are just your everyday tree hugging, peace loving vegans trying to make a difference to their tiny island. Household created by willky12. Schwarzenegger 1 1 No one in Northeney is at all surprised that Karl Schwarzenegger finds himself a single Dad. What is a mystery though is how his teenage daughter manages to put up with him. Household created by willky12. Schwegelin 1 It's not easy to get into contact with Agnes. Many residents try anyway because rumours have it that she is able to help with quite a few ailments� Household created by AcquireSimoleons. Singh 2 1 A baby between them and Chantal still hasn't made a permanent commitment to Ruprecht. Ruprecht is everything that Karl is not, so what's the problem here? Household created by willky12. Spahn 2 1 Herbert and Else are long time residents of Northeney, living in the same small house with their much loved Dachshund Fritz, who is actually the fourth Fritz that has been a part of their household over the sixty years they have been together. Household created by willky12. von Eulenburg 2 1 1 1 The Von Eulenburgs don�t mince words. Well, Elmar doesn�t at least. Mostly he spends his time taking his foot out of his mouth. It�s no secret he prefers the company of his beloved horse Ed. Household created by willky12. First download the world, unzip it and install the sims3pack the same way you install all sims3packs. Quit your game and the launcher afterwards. 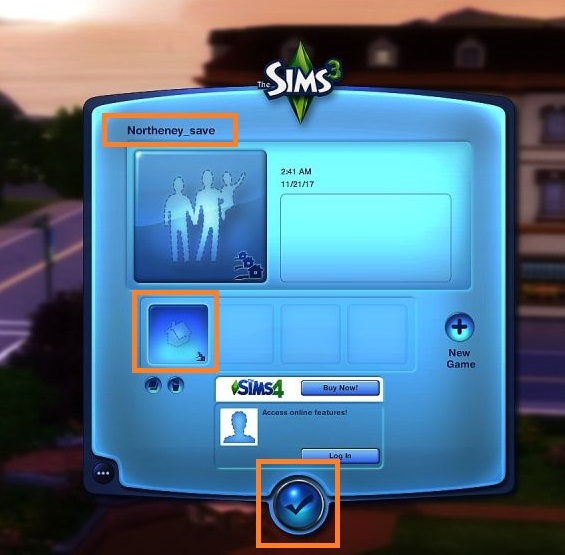 Then download the save file, unzip it and put the entire folder called Northeney_save.sims3 AS IS with its content into your game�s Saves folder. Please don�t rename it and don�t remove files from it. Where your Saves folder is located depends on your operating system. For Windows 7 it�s in Documents\Electronic Arts\The Sims 3. Now start your game. The save file should show up along with your other saves, you can identify it by it�s name and the missing preview picture as it was saved with no active household. 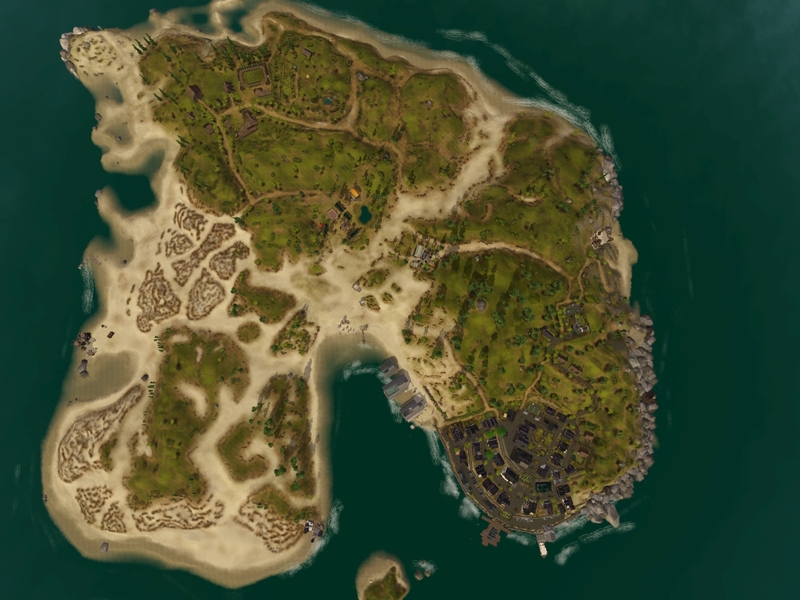 The island is roughly divided in to three parts - the town, the village and the remainder In the town you�ll find most rabbitholes and residentals. It�s the cultural center of the island and offers plenty of activities. The village consists mostly of former farm houses or houses for the farm workers. They have been turned into family homes, often with stables. Orchards and pastures are close. 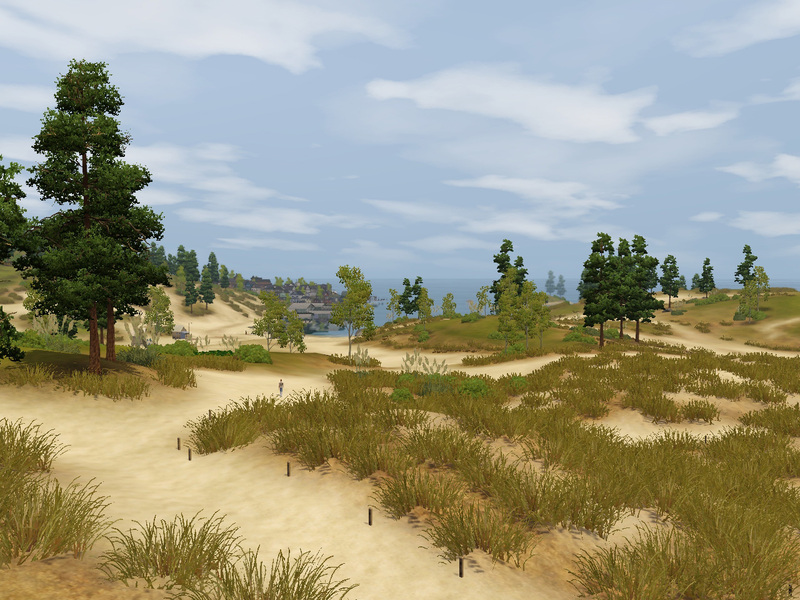 Large parts of the island are dunes though, inviting long walks at the beach or exploring the area on horseback. Fishing is possible almost everywhere. br = bedroom, ba = bathroom. Cribs are not included in the sleeps count. 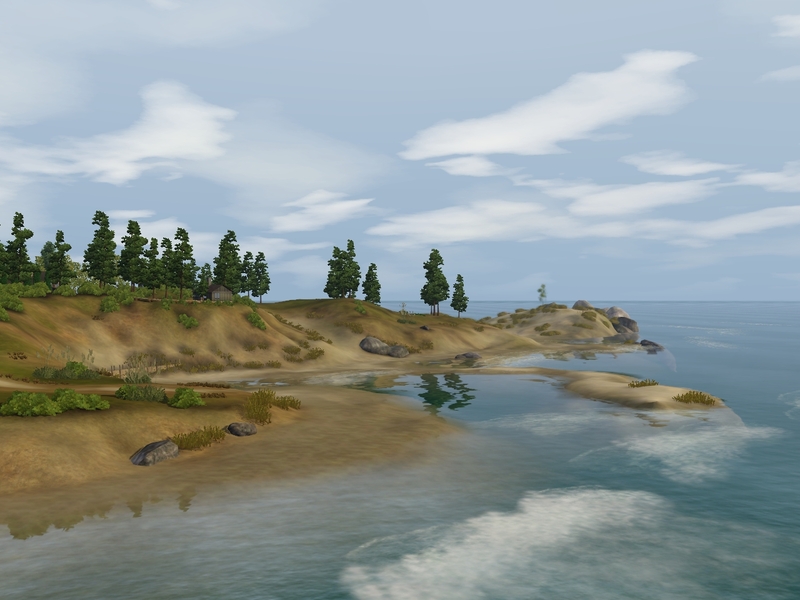 Our lovely little island is happy to welcome visitors and new residents. Please be advised that in order to maintain our quaint and quiet way of life, there are no vehicles permitted in Northeney - no cars, no bikes, no scooters, no brooms, no buses, no taxis, no limos, no trucks, and no carpool. We do not offer pizza delivery or maid service. Our last repair technician has moved off island, so please check out a DIY book. We welcome children, and they walk to our excellent school. We love them so much that we don't send them to boarding school. We do not enforce our teen curfew. There are no child adoption services on the island. Though the main land reports the occasional alien encounter, our skies are free of UFOs, though you may meet a green resident or visitor out and about town. We are happy to provide mail service and daily newspaper delivery. A butler service will be available. Huge thanks to Crowkeeper, willky12 and attuned, whose constant support and practical help made this world possible. Also to SimmyRN, mammut, maramaja06, ktarsims and Don Babilon for testing and advice. The names of the rabbitholes don't survive CAW export. If you don't use the provided save you will have to rename them yourself. The game likes to respawn the trash can in the resort in front of the entrance stairs no matter where I place it. Better to move it someplace else to avoid potential (but not very likely) routing issues (fixed in savegame). 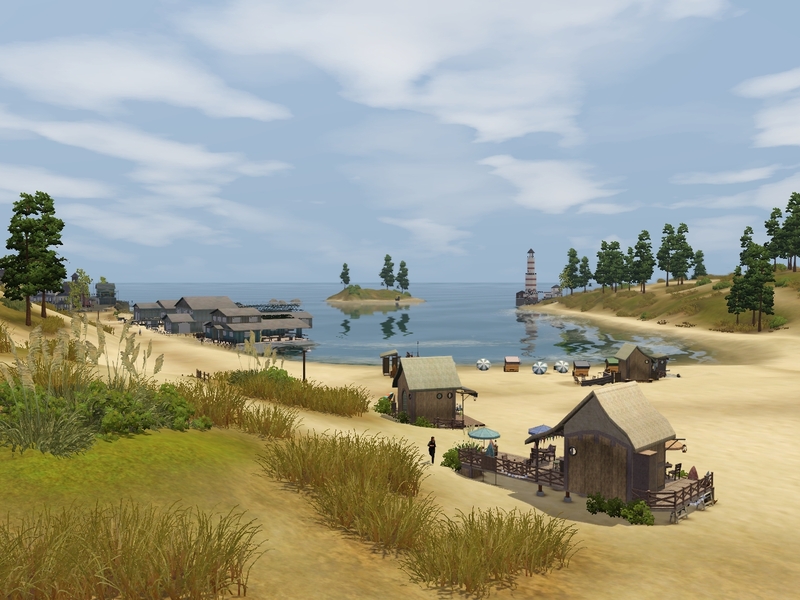 If you don't use the provided save, please note that in some fresh games the Seaport lot and the Black Gull lot are not accessible due to the way the lots are built. This does not happen in every fresh game. But if it does, enter build mode on these lots and set the front of the lot again. This should resolve the issue for this save. If you start a fresh game in this world, you might have to do it again. Please note that plattform and slide into the ocean in the Old Boathouse Pool are decorative only. Sims cannot use it, nor can they climb onto that plattform. If you try to make them, they will show the weirdest routing and eventually get stuck. You will have to manually reset them in this case. Wild horses tend to get stuck in the town. I recommend to play without this option. I also recommend to use NRAAS Overwatch to tidy up some other EA bugs. There are different versions of the Bistro and Equestrian Centre Rabbithole rugs floating around. So in case they are missing in Northeney please manually replace them with the version you have installed. Please don't use two different versions of the same RH rug at the same time, I'm not sure if this wouldn't cause conflicts. 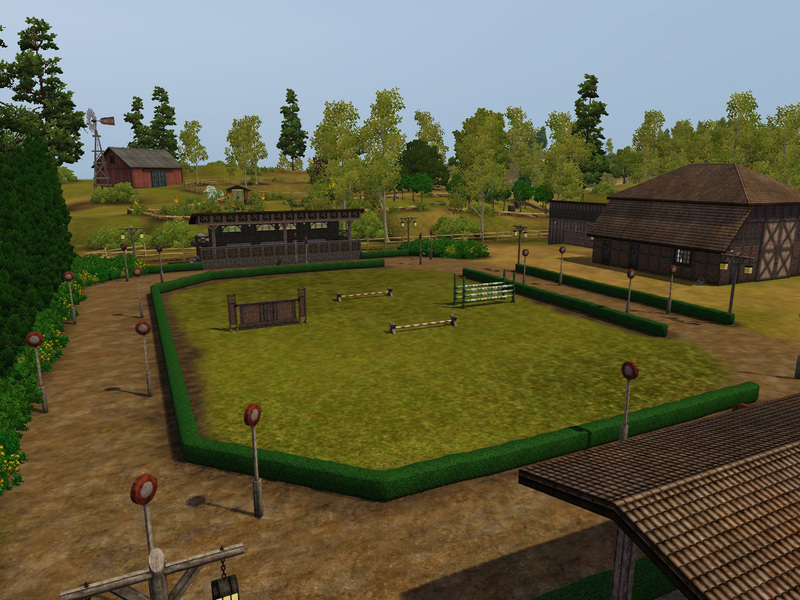 The Equestrian RH rug should be located at the Bytzel-Anger (the big lot with the horse training course), the Bistro RH rug is supposed to be at the Harbour Master's Office. The names for the seasonal festival days at the festival lot don't seem to survive caw export. So if you have only generic names for them feel free to apply whatever names you want for them (fixed in savegame). You will need to reset/replace the ITF-Elevator at the Institute for Science or your sims won't be able to use it. This is an EA bug. 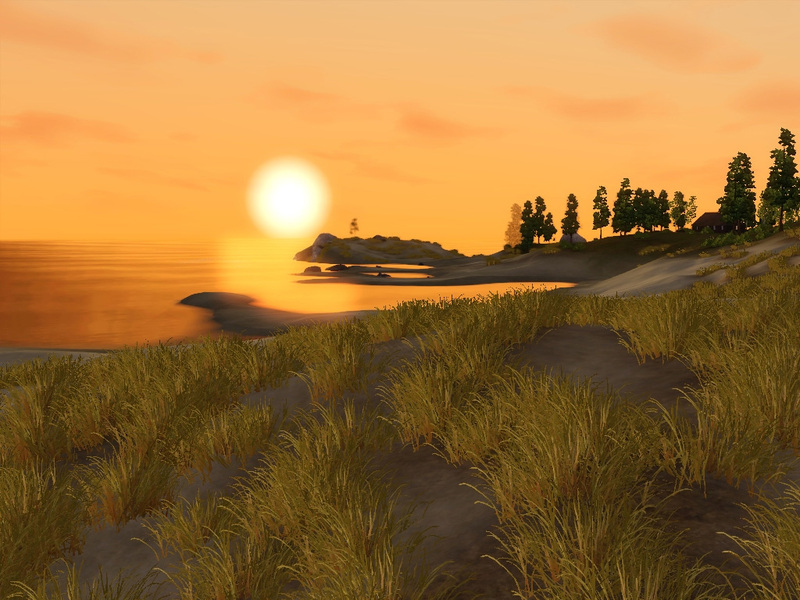 Northeney_save.sims3.zip | Description: Please install the world prior to using the save!